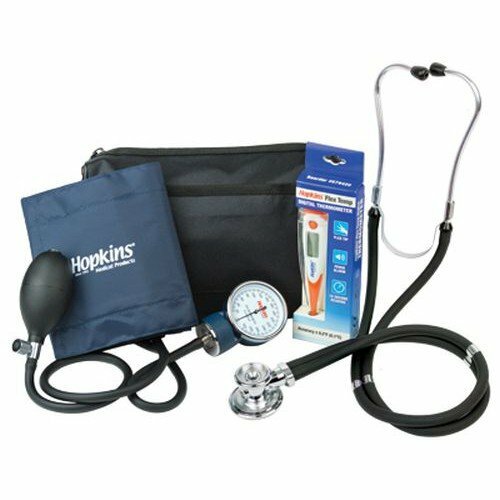 Deluxe FlexTemp Vital Signs Kit, manufactured by Hopkins Medical Products, is a pre-assembled kit that assists medical professionals with obtaining diagnostic measurements, such as blood pressure, temperature, and pulse. If you are wanting to also obtain a patient's blood oxygen saturation levels, you can order this kit with an oximeter. 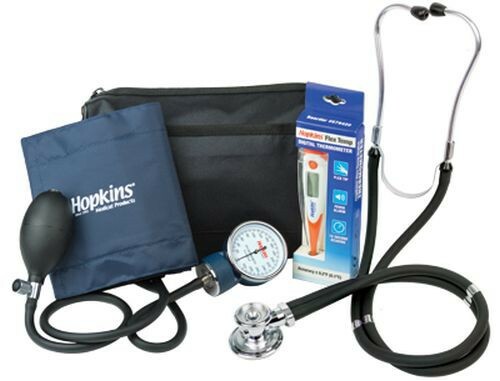 The FlexTemp Vital Signs Standard Kit comes with a deluxe Sprague stethoscope, sphygmomanometer, thermometer, with or without a pulse oximeter, and a nylon carrying case to keep everything in order. This kit is particularly ideal for clinicians that work in isolation. However, this kit is also great for use in general care facilities, home care, and more. If you're looking for superlative vital signs kit that will last, this is absolutely the kit for you. Includes a nylon carrying case to keep everything organize. Product Numbers: 520920 and 520921.